The last kiln was unloaded today (November 12) and now, the colorful finished products sit on shelves, awaiting a special IU East-sponsored luncheon event that will take place from 11 a.m. to 2 p.m. on Saturday, November 15. The luncheon will be held at First Friends Meeting in Boruk Hall, located at 2010 Chester Blvd. in Richmond. So will Piedad Llerena. In fact, the native of Ecuador wouldn’t miss it for the world. Llerena has produced 43 reminders in a variety of colors and stripes. “It’s something I can build with my hands to help others,” Llerena said, a real-estate agent and soon-to-be graduate in business from IU East. For a $10 donation, luncheon guests can choose their bowl and have it filled with soup. The meal also includes bread, a drink and a dessert. When guests are finished eating, their bowls are washed and returned to them to take home as a reminder that someone’s bowl is always empty. That’s the point. Empty Bowls is an international effort. She believes there will be about 250 bowls available this year. Most have been produced by students, but some have been donated by local potters, including Brian Haviland, Ann Tobin, and Elisha Frazier of Elm Tree Pottery. Event proceeds will go to Open Arms Ministries, a coalition of 14 churches and social ministries that serves as a clearinghouse of services for low-income families in Richmond and the immediate area. “We take care of needs of people on the edge,” said Lincoln Blake, vice president of Open Arms. He and Longley hope the program continues. Early indications are that it will. Members from the 14 congregations are making the soups, breads, pies and cakes. Three restaurants – Arby’s, Chipotle and Taco Bell – have provided cups, plates and plastic ware, Blake said. The effort has drawn attention from social media. That resulted Friday in the delivery of four boxes of Square Donuts as students gathered along with Longley to finish up some of their works during the Glaze-A-Thon, which also brought faculty, staff and students to the art studio to help glaze the ceramic bowls. Student Government Association members and 21st-Century Scholars have offered help, along with the service-learning club. All of the student artists are donating their time. Tobin and Longley echo that belief the event has taken wings because it’s such a good cause and the bowls offer a message that can live on. Hopefully, the bowls will outlive world hunger, too. For more information about the Empty Bowls Luncheon, contact IU East Assistant Professor of Fine Arts Carrie Longley, at (765) 973-8296 or clongley@iue.edu. 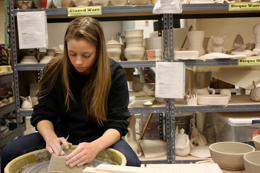 Photo: IU East student Tristan May, a general studies major, creates a ceramic bowl for the upcoming Empty Bowls Luncheon Nov. 15.